When Cha Eun Sang (Park Shin Hye), a poor student working three part time jobs learns that her older sister is getting married in America, she takes out her savings to buy a ticket to the US in the hopes of trying for a better life abroad. Upon arriving in the States, however, she not only finds out about her sister’s deception, but also loses her mother’s hard earned money to her sibling. She is left in the foreign country where she hardly speaks the language, with no place to go, no friends to call, and no passport to book a ticket home. She is rescued by Kim Tan, the illegitimate second son of Korea’s multi-billion group, who has been “exiled” to California by his elder brother Kim Won (Choi Jin Hyuk) who hates his guts and does not trust him not to steal the company from under his nose. When their brief adventure in the US ends however, they unexpectedly meet again in Korea, where their lives are intertwined by circumstance and fate. It may be surprising to some that this is the first Lee Min Ho drama that I have completed. I like Lee Min Ho. I think he is gorgeous and is a fine actor, but somehow, I have high standards when it comes to his leading ladies. I want him to be paired off with actresses who are as charismatic and charming as he is and I believe that after seeing Park Shin Hye in three dramas, she is a perfect foil to Lee Min Ho. 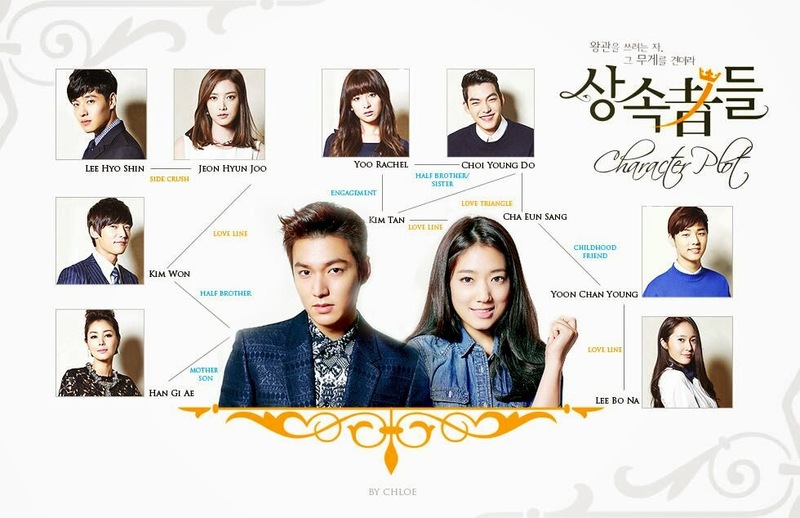 The Heirs is one of the most complicated Korean dramas that I have seen mainly because the plot is so complex. Each of the characters is connected to some other character and it takes a few episodes before the series finally lays out the entire relationship wheel fully. And a rich man having two wives for some dramas is enough but Heirs goes the extra mile and adds another to the mix, with a set up that is so whacked that I would be hard pressed to believe that it would happen in real life. Despite the complications however, this drama manages to hook viewers to the series because of the richness of the characters, especially Kim Tan. Its hard not to fall in love with this character simply because of his innocence and vulnerabilities and his desperate need to be loved. He wears his heart on his sleeve even though his family and friends trample all over it in every encounter. Yet, he is strong enough to offer his love again and again at every possible opportunity. 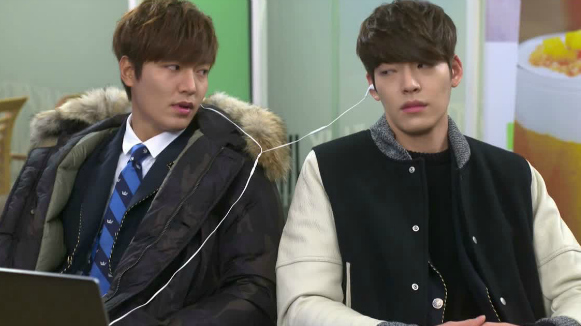 When he falls in love with Eun Sang, he confesses immediately and does not hold his feelings in. He shows strength and determination in the face of adversity and stops at nothing to protect the ones he loves, a trait that even his older brother could not match. His sheer determination in liberating his mother and his conviction in staying with Eun Sang — definitely swoon worthy. Shin Hye is a marvelous actress and I loved her portrayal of Eun Sang. Their sweet moments were the reason why I stayed up late at night to finish more episodes of the series. However, Shin Hye needs to loosen up when it comes to the kissing scenes, especially since this drama is addicted to prolonging the kissing scenes and shifting to multiple angles before the actors move again. When they embrace, cuddle or hold hands, it seems more natural and these were my favorite parts of the series. BROMANCE. These two couldn’t stand each other but they used to be besties. In terms of supporting characters, I especially loved Kim Mi Kyung and Kim Syung Roung as Eun Sang and Kim Tan’s respective mothers. These two were really hilarious and the camaraderie they established in the drama became highlights of the series. Kang Min Hyuk and and Krystal as the lovebirds Chang Young and Bo Na were also fun to watch. They had great chemistry and I would definitely like to see more of them in future series. Kim Woo Bin as the hotel heir Choi Young Do is equal parts annoying and endearing as his back story is unveiled in the drama and he makes for a really good third person in the love triangle. I was a big fan of his love hate relationship with Kim Tan in this drama. There are also a lot of familiar faces — Woo Bin’s co-stars in To the Beautiful You Kang Ha Neul as Kim Tan’s senior and Kim Ji Won who plays his spoiled fiance from another rich family. Another thing that was great about this drama was the make up. When Kim Tan was at his low point, he looked so thin and haggard that viewers would just want to hug him and make the pain go away. The conflicts in this series were so irritating but effective that people just want to cheer on the star crossed lovers who are, after all just 18 year old high school kids in the series. I would have wanted for them to bring the pace forward at some point but as it stood, the scenes were distributed well and developed in such a way that the ending took its time to set up so that it did not become awkward. All in all, I’ve heard a lot of raves about this series but there were also some complaints in casting Min Ho in yet another teenage role. I agree that Min Ho should also take take on more mature roles in the future but his charm works whether he is playing a teen or an adult and I for one, am thankful that he paired up with Shin Hye for this one. I hope this will not be the last I see of them because they are so cute together. 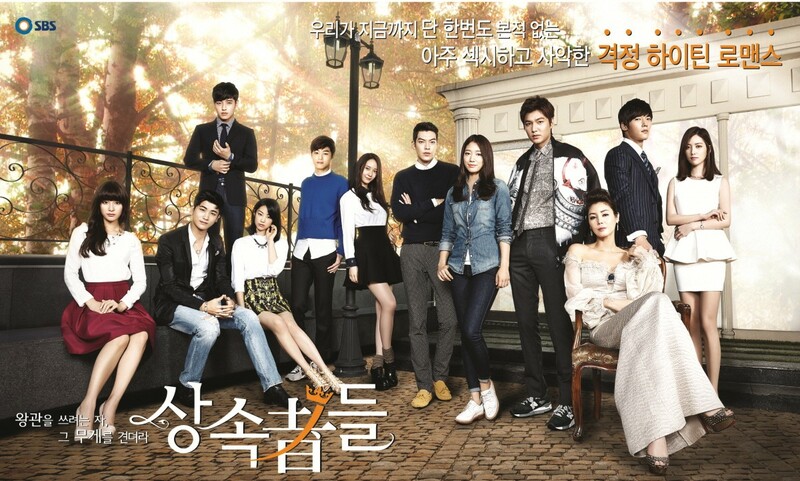 The Heirs, like many other series, has its strengths and weaknesses but I personally loved it and would recommend it to anyone who wants to fall in love and relish the possibilities of youth. It also talks about struggle and fighting for what you want, and in the end, I think everybody got what they deserved.